Run the application and select XBMC as shown below. 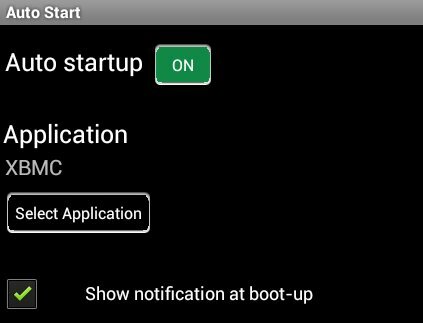 There’s no need to tick “Show notification at boot-up”, since XBMC will just show in the foreground. Done! Next time you restart your device XBMC will run automatically. I’ve tried it in Tronsmart Prometheus, and it boots to XBMC within 50 seconds. If you want to use another app in Android, simply exit XBMC. Autostart and StaY! app. It will allow you to make XBMC persistent: always in the foreground and restarts it when it crashes. I installed this but now Kodi 14.2 is broken and will not start, thus my box is stuck on black. Is there a shortcut key to press before the launcher kicks in, in order to get to the home screen or settings? The Kodi problem is probably unrelated to the autostart program. Try to clear Kodi cache in Android settings.